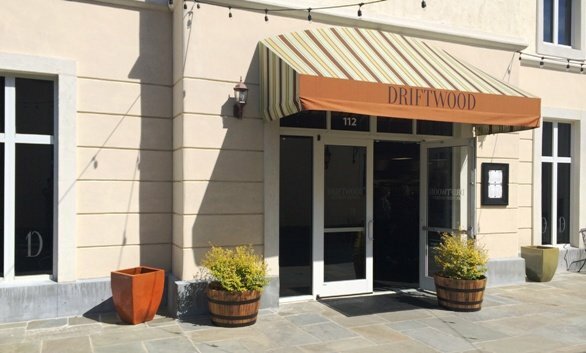 Driftwood Southern Kitchen, the newest restaurant at Lafayette Village is focused on delivering Southern farm to table at reasonable prices. Which is fantastic, because while I appreciate quality ingredients, I still have a problem when restaurants seem to abuse that local premium by charging outrageous prices. Which is not the case here at Driftwood Southern Kitchen. 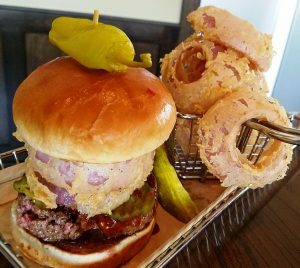 With a decently sized menu of Southern favorites and smoked meats (along with an all the time brunch menu), most entrees are priced under $20 at DSK. So how did the meal go? Read on and find out more! Out front I barely recognized Driftwood Southern Kitchen (referred to as DSK moving forward). Discrete signage but when you step in, it’s a large airy space and dining area. They’ve done a fantastic job re-decorating. DSK is a nice mix of mod-retro along with country. Think modern rustic which is totally an oxymoron but works here. 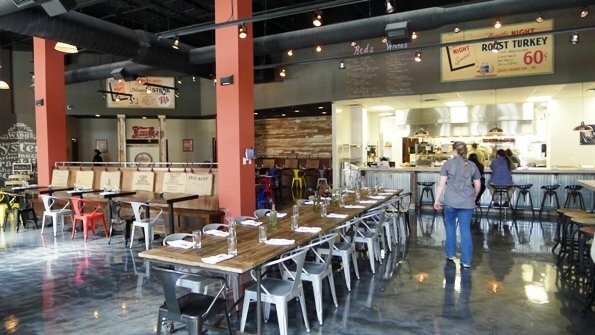 Metal and aluminum chairs, tractor seat stools near the open kitchen, tables that look to be made of refurbished wood planks, coffee sack hangings and more. The space is LARGE so I hope they get busy soon. There’s also a full bar serving up their special cocktails, beers and wine. On this sunny day, we’re eating outside with food blogger Kristen B (Gadaboutfood) along with Lauryn C (Yelp) and other friends. The courtyard at Lafayette Village has a faux-European feel but it’s the place to be in good weather. 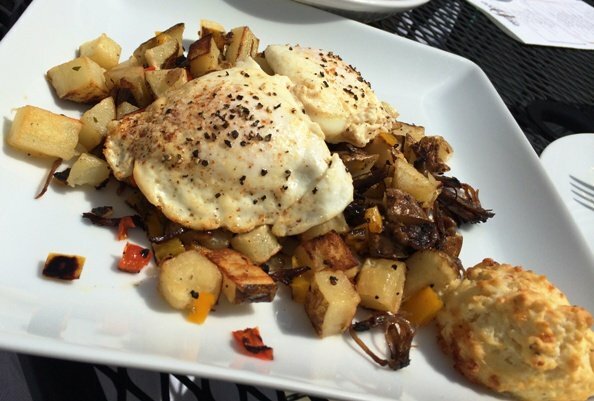 DSK’s small menu has lots of interesting twists including all-the-time brunch, marrow and fried oysters. 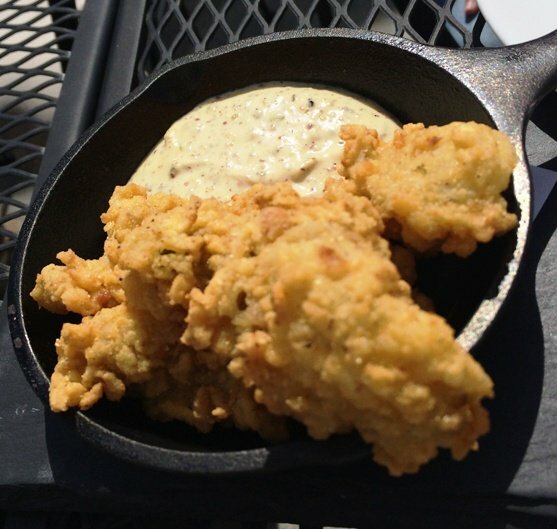 Most appetizers are under $10 with most entrees under $20 which means prices here are reasonable. While my friends order up cocktails, I go with a bottle of Spanish cava which is very reasonably priced at $22, woohoo! The table starts off with some mini-muffins, hill billy fries and fried oysters. About 15 minutes later, our apps show up. 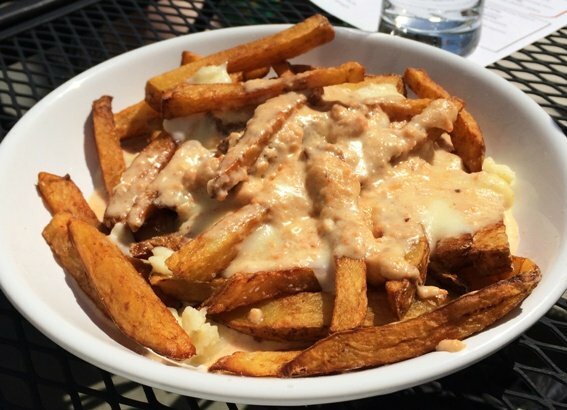 The mini-muffins are moist and tasty, the hill billy fries are served with “lobster gravy”, cheese curds over skin-on taters, yum! And my oysters came out nicely fried in a small cast-iron pan, not greasy at all. So we’re off to a great start and lots of sun, go Driftwood! Our entree span the menu, a couple of people order breakfast, I can’t resist the beef brisket and of course, some excellent bloody mary’s (based upon what others told me). My brisket come out in 5 or 6 large slices dabbed with some sauce, a large bowl of baked beans and a small cheddar biscuit a la Red Lobster! The brisket is nicely smoked and tender, there’s plenty of fat cap on top giving it a super rich taste and it’s served on a fancy wood plank. Not overly salted and all, pretty well done. The beans are definitely home-made but a bit plain even though they’ve been simmered with onions and other goodies. 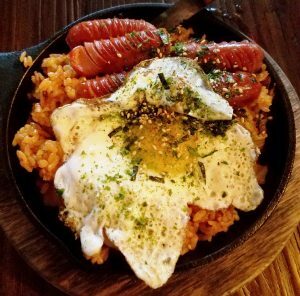 Not sure why there’s not more flavor in this dish, it looks great. 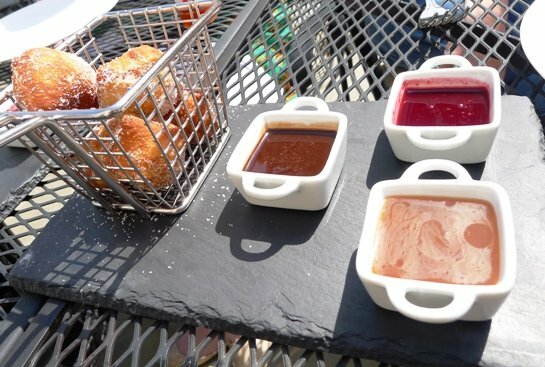 We finish up with New Orleans donuts, small beignets served with a trio of dipping sauces (chocolate, caramel and raspberry) which are served in a mini fry basket, cool. A nice finish, the donuts are fluffy and speckled with sugar but I think we’re all pretty much done after a long meal! Service is solid and it’s a long haul from the kitchen out to the sidewalk patio so thank you! So Driftwood Southern Kitchen is off to a great start after only two weeks in business! Interesting, reasonably price menu, comfortable and unique decor along with solid service works for me! It’s obvious they use great ingredients here and take a lot of pride in terms of preparation and presentation. I’m only hoping the flavors will get amp’ed up a bit even though I know Southern cuisine tends to be pretty subtle and basic. I’ll need to get back for a return visit after they’ve settled in a bit but thanks Driftwood Southern Kitchen and bon appetit! I’m glad you liked it! I had some truly doused-in-vinegar pulled pork and underwhelming mac and cheese on the side when I went. But we did enjoy the moonshine cocktails. I am willing to give it another try once it’s had some time to get up to speed.